I have visited the Coventry Transport Museum on a number of occasions, and I have been very impressed with the museum. This visit I attended with my 18 month old daughter and as a result I have a few observations about visiting the museum with a young child which I hope you can use to improve the museum further. 1/ My daughter enjoys colouring and I think the crayons and paper in the “future / activity area” and the cyclopedia section area a good idea. Unfortunately the tables were too high for my daughter. 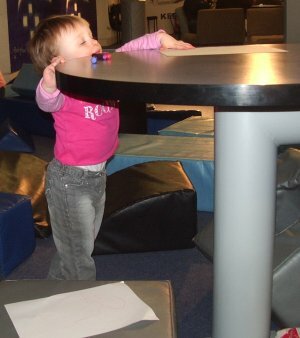 Although the cycleopedia had higher chairs it was too high so that I had to constantly hold on to my daughter, and as she was unable to put her legs under the table had to reach a long way forward. I think it would be much better if there could be lower tables, or lower sections on the existing tables. 2/ There are no high chairs in the cafe. You may already be planning to add these when the new larger cafe is created, but at the moment it is very inconvenient trying to feed a young child. 3/ The disabled lift in the model car section is a goods lift. Whilst this is not a problem in its self there did not appear to be any signs on how to use the lift. I tried pressing the button, but the lift did not appear, and I ended up having to lift the push chair up the stairs. I am very much impressed with the museum, and hope that these small changes can be made, or incorporated into future plans to improve the museum further. I would still recommend the museum for a visit. The museum is going through another phase of refurbishment. The model car section is almost complete, and the Blitz section is fully opened, but a large section of the museum is closed. I think that this is a positive thing as it will improve the overall museum. The area that is currently closed should be open by the end of February 2007. This entry was posted on Saturday, January 27th, 2007 and is filed under Babies, Children, Coventry West Midlands, cycling, General. You can follow any responses to this entry through the RSS 2.0 feed. Both comments and pings are currently closed. By way of an update, when I visited recently the lift has since been replaced with one of the modern compact lifts which is a great improvement. At least one of these points has been improved.